After listening this summer to protesters crying out for legislators to "read the bill" before they vote on health care, a Senate panel amending a health care bill today held a lengthy debate about what exactly is worthy reading material. The Senate Finance Committee considered for two hours today a Republican amendment -- which was ultimately rejected -- that would have required the "legislative" language of the committee's final bill, along with a cost estimate for the bill, to be posted online for 72 hours before the committee voted on it. 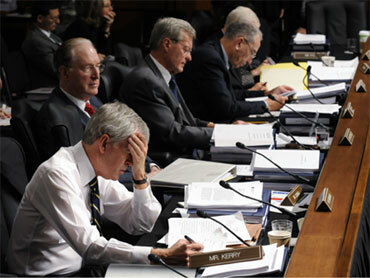 Instead, the committee passed a similar amendment, offered by Committee Chair Max Baucus (D-Mont. ), to put online the "conceptual" or "plain" language of the bill, along with the cost estimate. Usually, the Senate Finance Committee considers "conceptual" language because the actual legislative language in a bill is filled with jargon and references to existing legal code that can make it nearly impossible to follow. Sen. Tom Carper (D-Del.) described his attempts at reading the legislative language of a bill: "You read it and say, 'What did that say?'" The committee, he said, uses "plain language so that even I can understand" a bill. Still, "this is not a normal bill for us or for the American people," said Sen. Jim Bunning (R-Ky.), who introduced the amendment. "The devil is in the details. The way legislative language is written could have a large impact." Sen. John Kerry (D-Mass.) said the amendment was "fundamentally a delay tactic" for a piece of legislation that must progress quickly at this point, if Congress hopes to get it to President Obama before the year is up. "Anybody who thinks that is going to be transparent to the American people is really not telling it like it is," added Sen. Kent Conrad (D-N.D.). However, Sen. Olympia Snowe (R-Maine), the Republican most likely to favor the bill, said the amendment represented a "practical, pragmatic good govermment approach" to legislating. "We should not be afraid of having a better and complete understanding of what we are all doing," she said. "The fact is, words matter, and so do the numbers." Snowe voted with Republicans on the issue, and one Democrat -- Sen. Blanche Lincoln (D-Ark.) -- also voted for Bunning's amendment, which failed 11 to 12. Bacus' alternative amendment passed with a partisan vote.